In this day and age, with all the spending options available to us, it’s hard to save. The savings rate in most wealthy countries indicate that this is an understatement! In fact, in my country of birth (Australia) the national savings rate from 2000 to 2010 was 3%. That is called living beyond your means! Your ability to save will have a profound impact on your long-term financial situation. Start by looking at your budget to determine what you can afford to save on a monthly basis. I suggest you aim to save at least 10%. Look at ways to cut waste. Look at each of the “line items” in your budget and ask yourself: “Do I really need this? Does this add meaningful value to my life?” If not, be smart, be brutal – cut it out! Assign a “fixed” or “variable” notation to each line item in your budget. Those that are fixed generally can’t be changed; at least not easily. Those that are variable can be trimmed at a moment’s notice. Have savings targets. Create specific targets, so that when you achieve them, you do something to celebrate! It might be a night out to dinner with your spouse, a weekend away or something else to mark your achievement. Saving is not the same as hoarding. 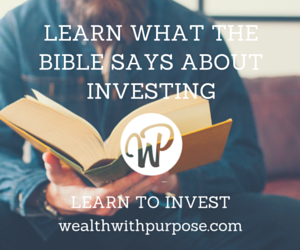 Saving is a sensible practice to ensure financial stability in your life, preparing for long-term goals and building wealth for Kingdom purposes. Hoarding is putting aside money, or other resources that are never going to be used in a meaningful way. They may well be passed to the next generation who will either spend the money or in the case of unwanted assets – just sell them off! I want to show you the power of saving, and the best way to do that is to look at two concepts: the first being Simple Interest and the second being Compound Interest. 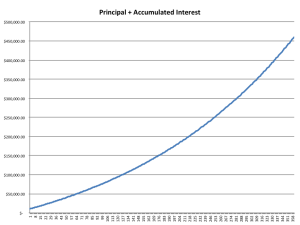 Compound Interest is where you will see the true power of saving. First, let’s look at Simple Interest. 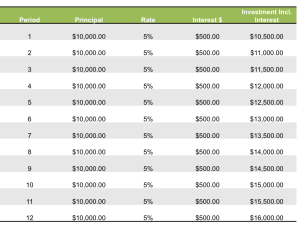 In the example below, $10,000 (the principal) is invested at a rate of 5%, and interest is only earned on the original principal. As you can see this amount grows nicely to a modest amount of $16,000 after 12 years. The difference between compound interest and simple interest is that: with compound interest you are earning interest on your interest. 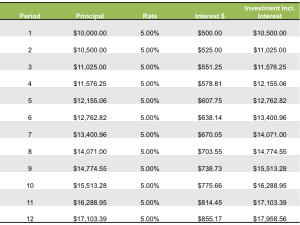 We take the same $10,000 (the principal) and the same interest rate of 5%. However, in each time period the interest is paid on the principal plus the previous time period’s interest. In effect, you have a growing principal that is accumulating more interest in each subsequent time period. The overall result is that you end up with closer to $18,000. This is a result that is 33% better than with Simple Interest. 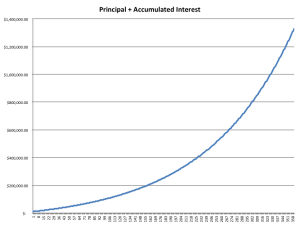 Now, what if we apply Compound Interest to a longer time period and add some regular savings? After all, most of us plan to save money as part of our life’s journey. Let’s look at the graph below to see what happens after 360 months (30 years) with monthly savings of $500. In this example, we start with $10,000 (the principal), and apply an interest rate of 5% compounded annually and we save $500 per month. After 30 years your original $10,000 will grow to more than $450,000! The issue is not so much the amount of $500 per month, but rather, the impact of regular saving. As you can see by the graph, the more you save in the early years, the steeper the growth in the latter years. This highlights the importance of starting young, and the need to progressively increase your savings as your income increases. When I was a financial planner, I observed that the most common mistake made by the vast majority of people was: the more they earned the more they spent! The smart thing to do is to increase your saving as your income increases. But what happens if we increase the return from 5% to 10%? In the next graph, we use the same assumptions of $10,000 starting balance, plus $500 per month of savings, but use a higher rate of return. That same $10,000 has grown to more than $1,300,000. A great result! ➢ Compound Interest has a profound long-term impact, which will be greatly enhanced if you start now! ➢ The higher the rate of return the better the overall result. 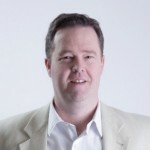 ➢ It is entirely possible for the average person to save for long-term goals such as their kids’ education, retirement and funding what God has put in their heart such as missionary work or supporting an orphanage. .
An important disclaimer: interest rates are at historic lows, so these graphs are not realistic if they remain at these levels. The impact of compounding interest applies equally to other asset classes which produce higher returns than cash.